What is new in 1-0-8??? 1-0-8 Emergency Response Service is a 24X7 emergency service for medical, police and fire emergencies. It is a free service for any Emergencies involving people. The service is available for the entire state of Andhra Pradesh ,Gujarat, Uttarakhand, Goa ,Chennai, Rajasthan, Karnataka and Assam. It a 24x7 emergency service. Under what situations you can dial 108? Do not call 1-0-8 if there is no ‘serious people emergency’. It is not a number for enquiry or information gathering. Do not play around by dialing 1-0-8 as a joke. Otherwise a call in real emergency could be blocked and a life could be lost. If you happen to call 1-0-8 by accident then do not hang up until the officer asks you to do so. Now, all you need to do in case of an emergency, like ill health, accidents or fire, is to dial 108. A fully equipped state-of-the-art ambulance will arrive within 20 minutes in urban areas and 30 minutes in rural areas. The medical staff in the ambulance will not only transport the affected person to hospital, but will also provide pre-hospitalisation treatment free of cost. After collecting the information over phone, a fully equipped ambulance or fire vehicle will be dispatched to the spot. These vehicles have been fitted with Geographical Positioning System and Geographical Indication Systems to help locate the geographical position of the emergency scene. The ambulances have been fitted with medical equipment ranging from defibrillators and ventilators to extrication tools, to handle any emergency. Explaining the salient features of the project, EMRI CEO Venkat Changavalli said EMRI has already tied-up with various hospitals and nursing homes to provide free hospitalisation for the first 24 hours until the victim is stabilised. He said EMRI, which is a non-profit organisation, has been founded and funded by Satyam Computers. How about walking to office??? yup... this one is something like "klaW ylenoL kraD tnasaelP ehT ..." ... just got up from the bed early today, around 5:30.. it has been looooong time since i got up at that time... from arrival of my new companion, my lappy, i have never got up at that time... yesterday i went to sleep early, as i came early from office, at 10pm itself. So i didnt bring my office laptop with me to home. As i got up from bed, i just thought, why cant we go to office by walk?? i dont have to carry my bag also, since the office laptop is there in office, which is very rare thing to happen these days. Ok.. i'm goin to do that... freshed up, played games for 30 mins, and started walking from home. Did i mention that my office is around 10kms from my home?? ok.. now i have... started exactly at 6:50am from my home. The climate was not that cold, though it was chill, it turned to normal by 7:30 itself.. at that time i was near the Ejipura signal in Intermediate Ring Road. I was so happy that i dont have to wait for the signal to turn green... wowie... overtaking all the vehicles which were standing still at the signal, i reached the all time busy Sony world signal.... there too it was heavy traffic.. surprisingly i met one of my college junior, just thought i have seen that face somewhere, but hesitated to go n ask as if its not her, then the scene would completely change. but as i said, surprisingly, she came forward, and little chat, just a little break there in otherwise a continous non-stop walk. At around 8am, i reached madiwala. then i remembered to book ticket to my next week plan to go to hyd. went to manish travels, just asked when is the first volvo bus to hyd from bangalore, he said at 6:30, ok.. book i told, got my ticket booked, just 2 mins pit-stop there, continued my walk... thru maruthi nagar, BTM , thru the park once i used to go for walking, thru the plrk in which we played shuttle, thru the playground once we played cricket, i reached my office, which is there above shopperstop near jayadeva hospital, at around 8:50 am.. a non-stop 2 hour 10km walk to office.. was a gud experience. 1. i would be happy in wasting 2 hours of my time in any-other way than in this way. 2. On serious note, i dont want to voluntarily put myself exposed to a non-stop 2 hour 10km pollution. 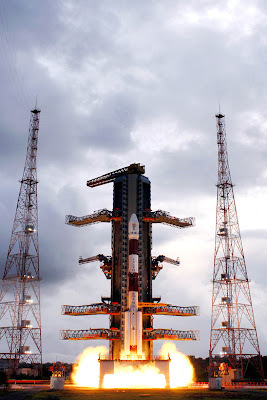 First latest update is, it has been ___________ (you can fill the blank with the value showing in the count-up timer below the Heading of this page) since the launch of Chandrayaan 1. Secondly, Chandrayaan 1 Camera Tested... ISRO has released the first pics from the historic space craft yesterday - Oct 31, 2008. 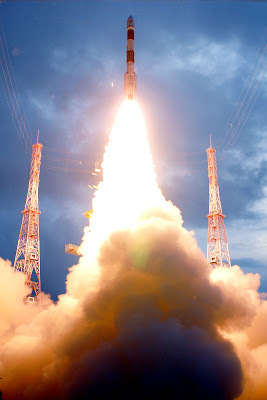 It may be recalled that the 1380 kg Chandrayaan-1 was successfully launched into an initial elliptical orbit around the Earth by PSLV-C11 on October 22, 2008. 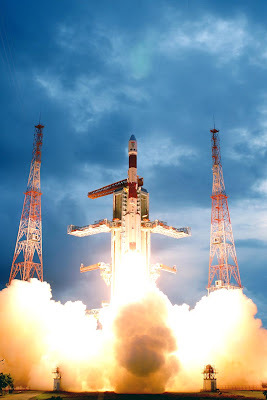 This was followed by four orbit raising manoeuvres, which together raised Chandrayaan-1’s orbit to a much higher altitude. The spacecraft is now circling the Earth in an orbit whose apogee (farthest point to Earth) lies at 267,000 km (Two lakh sixty seven thousand km) and perigee (nearest point to Earth) at 465 km. In this orbit, Chandrayaan-1 takes about six days to go round the Earth once. The spacecraft performance is being continuously monitored and is normal. The Terrain Mapping camera (TMC) on board Chandrayaan-1 spacecraft was successfully operated on October 29, 2008 through a series of commands issued from the Spacecraft Control Centre of ISRO Telemetry, Tracking and Command Network (ISTRAC) at Bangalore. Analysis of the first imagery received by the Indian Deep Space Network (IDSN) at Byalalu and later processed by Indian Space Science Data Centre (ISSDC) confirms excellent performance of the camera.The first imagery (image 1) taken at 8:00 am IST from a height of 9,000 km shows the Northern coast of Australia while the other (image 2) taken at 12:30 pm from a height of 70,000 km shows Australia’s Southern Coast. TMC is one of the eleven scientific instruments (payloads) of Chandrayaan-1. The camera can take black and white pictures of an object by recording the visible light reflected from it. The instrument has a resolution of about 5 metres. 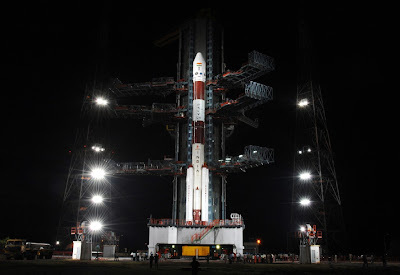 Besides TMC, the other four Indian payloads of Chandrayaan-1 are the Hyper spectral Imager (HySI), Lunar Laser Ranging Instrument (LLRI), High Energy X-ray Spectrometer (HEX) and the Moon Impact Probe (MIP). 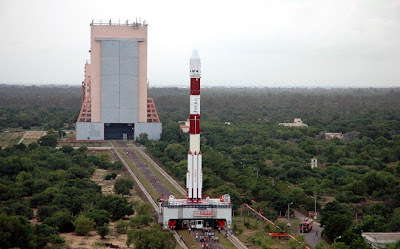 The other six payloads of Chandrayaan-1 are from abroad.